Download free business HTML5 template from ThemeWagon. It's a new template for modern design website. Updated and published in 2017. 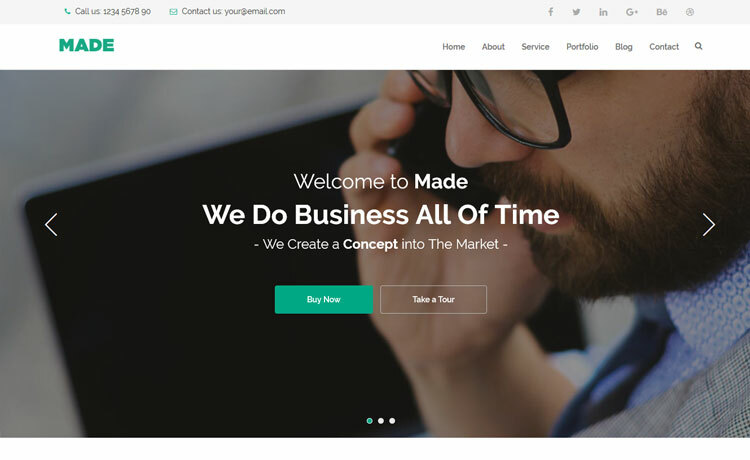 Made One – free business HTML5 Template is such a template that provides the creativity and professionalism to a website. It especially is crafted for business services websites. The Bootstrapthemes Team developed it in a professional way which contains modified body design, not as a general. It’s built with Bootstrap grid system why it is responsive. Most new clients want a handheld device version of their website. Creating a web page for each device would be impractical. Responsive web design is the way which proposes that design and development should respond to the user’s choice based on screen resolution, platform, and adjustment. The development team grabs that point. They create this template according to the client demand. This template fits every screen resolution and device. Check it in Google Mobile-friendly Check tool that it is responsive or not. What brings to you in this free business HTML5 template? Beautiful descriptive owl-carousel slider in the home section will focus your organizations’ brief description at a glance. Also, you can describe your organizations’ details in about section. Slider in the service section will help you to focus on your skills. There’s also a portfolio, a blog and a testimonial section as your need. Simply say, Made One free business HTML5 template is a perfect web template for your organization’s websites. Made One – free Business HTML5 Template is very easy to customize and implement. Developer team has commented each section of this template’s page carefully. They also prepare documentation on the relevant section for the user. Through this documentation, the user can easily customize itself as their wish. They can quickly add the brand logo, header, footer and so on. Made Two helps users to build an elegant, striking and modern website without wasting too much time. Sticky Header with Contact and Social Supports. Footer with Contact, Latest News, etc. Powered by Bootstrap GRID System. Well Commented, Indented and Clean Code. The quality of this template is so high though it's free. can this be uploaded on blogger.com (blogspot)? I tried but got message that there was no xml file? inside the zipped file, there is no xml file. In this case, how do we upload to blogspot? if not possible, pls give me an alternative free blogspot template that has the same look as “made one”. We have no template for that.